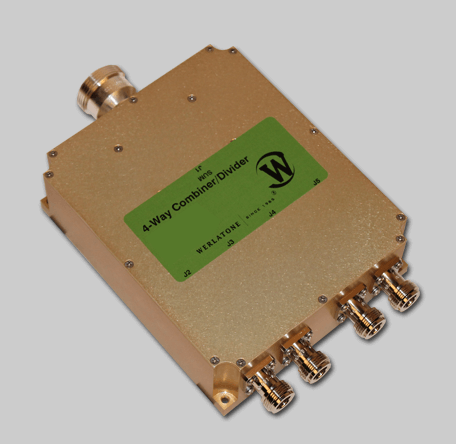 Werlatone's newest addition to our 20-1000 MHz family of products is the High Power 4-Way Combiner, Model D9075. Conservatively rated at 1000 W CW, this compact design measures 4.7 x 5.7 x 1.75", and operates with less than 0.65 dB of insertion loss across the entire band. The D9075 provides excellent port-to-port isolation and tolerates severe input unbalances. Werlatone’s newest addition to our 20-1000 MHz family of products is the High Power 4-Way Combiner, Model D9075. Conservatively rated at 1000 W CW, this compact design measures 4.7 x 5.7 x 1.75″, and operates with less than 0.65 dB of insertion loss across the entire band. The D9075 provides excellent port-to-port isolation and tolerates severe input unbalances.